The cy pres doctrine is a method of distributing a damage fund or unclaimed trust when the original purpose cannot be achieved. In class action lawsuits, if a payment of damages is to be made to class members, a fund is created. After class members’ claims are paid, a residual amount may remain, and under the doctrine of cy pres, judges and class counsel can recommend that residual funds be distributed to the “next best” use. In addition, when the amount of damages to each individual class member is too small to warrant distribution, the cy pres remedy can be used for the entirety of a statutory damage award. The concept of a cy pres award is that money will go to support a charitable purpose that is closely related to the underlying purpose of the litigation that created the award. Cy pres can also be used in situations with respect to unclaimed estates in trusts in cases when the stated beneficiary no longer exists, cannot be located, or the original bequest cannot be honored, the attorney can recommend disbursement of residual funds to support the charitable work of legal services. Because it benefits those most likely to be unrepresented or underrepresented in the justice system, the Pennsylvania Legal Aid Network is an appropriate recipient of cy pres funds. In addition, the work of PLAN benefits the broader society by ensuring that the justice system itself remains fair and equitable. 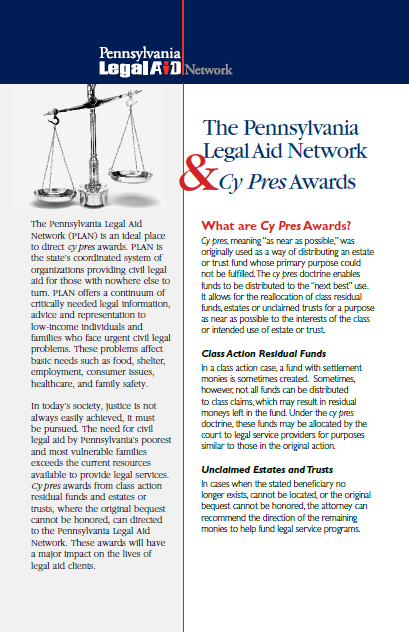 Additional information on cy pres awards to the Pennsylvania Legal Aid Network is contained in the the brochure at this link. For more information on cy pres awards, please contact the PLAN Development Office at 412-586-6137.